Since Cinco de Mayo is a celebration of Mexican heritage, Cinco de Mayo food naturally includes a lot of Mexican favorites such as tamales, chocolate, and margaritas. Make your Cinco de Mayo party truly memorable by mixing traditional Mexican cooking with new twists to suit your tastes. The most basic and common Cinco de Mayo food is chips and salsa. Authentic, warm tortilla chips paired with simple homemade salsa always go well with later meal courses as well as drinks. To make simple salsa, chop and seed Roma tomatoes, one small Spanish onion and fresh cilantro. Mix it together and you have a refreshing salsa dip that everyone will love. Don't be afraid to experiment by adding cumin, green chilies, red pepper flakes, jalapeños or other peppers. The key to this crude salsa is that the ingredients are fresh. As long as you are working with fresh ingredients, the results are sure to please. 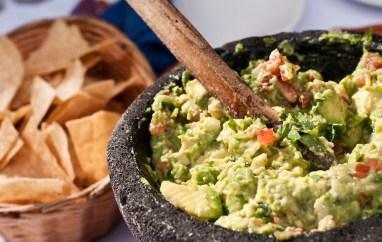 Guacamole - Mash two ripe avocados with two teaspoons of lemon juice. Add salt and pepper to taste. Black Bean Dip - Mash one can of black beans and mix in one 16-oz. container of sour cream. Mexican Sour Cream - Mix taco seasoning with sour cream and you have a delicious dip. A bowl filled with tortilla chips surrounded by these tasty dips is sure to keep palates satisfied. If you are serving a main course for your Cinco de Mayo party, let the flavors of Mexico be your inspiration. Tacos, tamales, burritos and more are satisfying and filling and most people enjoy authentic Mexican food as well. Make sure to garnish with plenty of sour cream and guacamole to help balance the spicy flavors. Fajitas are a great food for small parties. Generally, they consist of chopped chicken, pork, or steak along with sautéed onions and bell peppers. You can do the meat ahead of time and marinate it in a pre-made fajita sauce to keep things simple. Serve them hot off the skillet with warm tortillas, salsa and rice and beans. Tamales are a very traditional Mexican dish. Tamales are extremely time consuming to make from scratch but well worth the effort. You can also substitute more modern or pre-made ingredients for some of the more traditional methods of cooking. If you decide to treat your guests to tamales, take advantage of super easy side dishes and appetizers to make the party prep easier. If your party is in the afternoon you might want to consider a Cinco de Mayo cake to coordinate with your decorations. If you're having a Cinco de Mayo dinner party celebration, you cannot get away without having dessert. Thankfully, Mexican desserts are typically simple and feature regional flavors. True Mexican desserts are few and far between. Of course the traditional dessert would be a flan. Flan is a custard-type dessert which is made with evaporated milk and is typically fairly mild in flavor; however, you can dress it up with tropical fruits or even a chocolate or caramel sauce. Plan ahead though; flan takes a long time to cook and set. Fried ice cream is another popular Mexican dessert. Although it sounds complicated, fried ice cream is actually very simple to make. The trick is to make sure that the ice cream is thoroughly frozen hard. Amazingly, the ice cream doesn't melt as you fry it as it is protected by the coating. You can't have a Cinco de Mayo party without drinks! While everyone may think of tequila and margaritas when they think about Cinco de Mayo, there are a variety of Mexican-inspired drinks to be had. Sangria is a wine-based punch that hails from Spain. It goes very well with Spanish food and is different than your typical dinner drink. Most people tend to think of having margaritas with Mexican food. They certainly pair well, and make a great before or after dinner drink at a Cinco de Mayo party. Abuelito is Spanish coffee that is distinctive because it is so strong. Many people mix it with dulce de leche or chocolate to create an after dinner coffee drink. To enjoy your Cinco de Mayo party and not get bogged down with the meal prep, plan ahead. Veggies can be chopped in advanced and you can take advantage of pre-made products. Try to balance your use of pre-packaged Mexican foods with more authentic foods to give a real Mexican flair to your party food.